One year ago, Hurricane Maria devastated Puerto Rico. After the storm, the island’s healthcare system collapsed. While some clung to the few services available, others invented their own solutions to stay alive. Many felt the U.S. government had forgotten them. Hurricane Maria made landfall in Puerto Rico’s southeast region with 155 mph winds. Barely two weeks had passed since Hurricane Irma grazed the island. The island went dark, with no communication system. When the chronically ill and the wounded went to seek treatment, they often learned that hospitals could not provide services. 'Surviving Maria' tells the story of Maria through a series of vignettes about those who lived through it. One month after the hurricane, Mirella suffered a stroke. Now she clings to life through a respirator. Many of the deaths resulting from the hurricane were linked to the lack of electricity. Though authorities continued to report 64 deaths, journalists working independently began to find far higher numbers. Facing pressure, the government commissioned George Washington University to conduct a study, which concluded that 2,975 people had died as a result of the hurricane. Governor Ricardo Rossello admitted that Puerto Rico's disaster protocols were "insufficient" and said doctors were not prepared to accurately report deaths in the midst of a catastrophe. The mayors of Yabucoa and Cayey, the first municipalities struck by María, spoke to Univision about the deaths, blaming them on a lack of electricity. They criticized the island and the U.S. government for their slow response. President Donald Trump insists that his government's response to the disaster in Puerto Rico was "successful" and "one of the best jobs that's ever been done." But many Puerto Ricans argue that the federal government discriminated against the island because it’s a U.S. territory, not a state. This year, FEMA recognized its failures in attending to the island’s needs: it admitted local personnel were not prepared to respond to a Category 4 hurricane like Maria. Puerto Rico’s Secretary of Public Safety, Héctor Pesquera, has been heavily criticized for the agency’s slow and insufficient response to the emergency. Puerto Rico has 69 hospitals, both public and private. 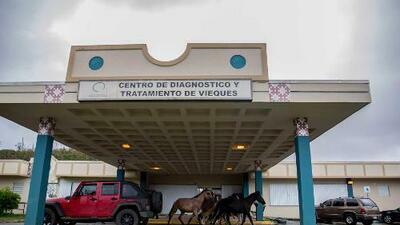 Some will be demolished, like the hospital on the island of Vieques. Others have already trained their doctors with new protocols in the case of another major hurricane. The Dr. Federico Trilla hospital, located 11 miles from San Juan, is one such hospital. But, a doctor shortage has aggravated the health crisis: only 9,000 doctors remain on the island, compared to 14,000 in 2006. Some emergency rooms have called on foreign doctors to fill the gaps. Hospitals offer incentives to attract and retain specialists, such as increased salaries and rent-free office space. Psychiatrists are especially in demand. There are 366 across the island, and patients often wait up to three months for an appointment. Adrián Torres, who suffers from a congenital disease, fell into a depression after the hurricane. The electric wheelchair he depends on to get around was out of commission after the storm. “If Puerto Rico were to suffer another Maria, I don’t know what I would do, Torres told Univision. I suffered a lot from the consequences of that hurricane. This little house was shaking and I said: 'At any moment this could collapse.’ There was nothing, there was no other place to go”. Before the storm, Puerto Rico was already facing a severe economic crisis. Over the past decade, many on the island saw their quality of life diminish. Mental health problems increased. Maria only deepened the emotional wound. Nieves sought psychiatric help to deal with the emotional impact of the hurricane. “Several hurricanes have been forecasted in the Atlantic and emotionally I’m not 100%. I cannot look at the news, I avoid it for that reason. I'm afraid of losing what little I have now. It is not okay. It's hard to talk about,” she said, asking that her last name not be published.